Scott Cowan, 50, has the distinction of being Century Cycles’ longest-tenured employee, with a whopping 18 years of service to the company. A resident of rural Medina county, Scott graduated from Miami University with a degree in Geography and a minor in cartography. At those rare times when he’s not at Century Cycles or on his bicycle, Scott enjoys a new interest in old barns, watching “Andy Griffith Show” re-runs, and collecting wine and all kinds of other things. Q: So how did you get your start at Century Cycles? A: (Laughing) Do you mean how did I start the company?! Back in 1991, I was already an avid cyclist and I wanted to do something I believed in. I approached a local bike shop and they hired me at no pay to apprentice to learn the bike store business. We opened the Medina store in March of 1992 with just $14,000 of capital and against all odds. Most people thought we’d be gone in six months, but 18 years later we’re still here and thriving. By the way, I did a geographical business study of Medina and it was phenomenal how accurate it was at predicting our success. A degree in geography does pay off! Q: How many bikes do you own? A: (Laughing again) Personally or professionally?? I have five bikes that I ride pretty regularly. My favorite to ride is my Raleigh Team carbon bike, and I love my Santana tandem. I also collect bikes and have well over 100 in my collection, with about 15-20 that are particular favorites. But if you really want to get technical, I own thousands of bicycles a year through the stores, taking care of them as they go from the manufacturer to a loving home through Century Cycles. Over the past 18 years, I estimate Century Cycles has built over 40,000 bicycles and found them happy owners. We’ve started thousands of kids on their first bikes and it’s amazing that they are now starting to come back to us, for their kids’ first bikes. Q: What was your first bicycle? 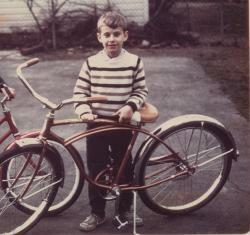 A: My first real bike was a Schwinn Typhoon in the rare coppertone color. We sold it at a garage sale for $10 because I wanted a 10-speed. However, I found one exactly like it and it’s now in my bike collection. Q: What has changed since you started the business in 1992? A: A lot. We’re still providing fun on two wheels, but what we’re selling has changed a lot. The bikes are a lot better, our mechanics are better-trained, and it’s all better for the consumer. Q: What’s your favorite local trail or ride? A: I love riding through the Metroparks and also riding along on Lake Road on the west side, where you see the lake peaking out between the houses. I also really like riding out of my driveway and going south to the country roads of Wayne county. Q: What is your biggest accomplishment on a bicycle (besides getting 40,000 people on them)? A: I’m really proud of the Bike To School Challenge we help organize in Bay Village and are planning to expand to more schools this spring. I also did a ride from Boston to Halifax, Nova Scotia, back in 1987 -- an 800-mile ride I did in 12 days with a buddy from college. It was an awesome experience with spectacular scenery, although it was also pretty rugged. Some nights we went to bed without dinner and we rode up Cadillac Mountain on our rest day just for fun! Q: What is your favorite post-ride beverage? A: Well, during a long ride, I love chocolate malted milkshakes. After a ride, it’s beer. And if it’s a been a long ride, I’m not even all that particular about what kind! Q: What bicycling advice do you most often give to people? A: In a lot of conversations I have with people, they tell me that they don’t have enough time to ride. The most common advice I give is to make the time to get out and ride your bicycle. Make it part of your life because it will make it better. A: There are two right now: “The Life and Times of Bob Marley” and “The Wild Turkey.” That last one is not about bourbon (laughing)! It’s a really interesting book about the wild turkey in history, lore, hunting, and so on. Q: What’s a favorite non-local trail or ride? A: The eastern coast of Lake Michigan is awesome. The Natchez Trace was also spectacular. Q: You work primarily out of the Rocky River store yet you live in Medina county. How do you cope with the long commute? A: Satellite radio helps a lot. I also try to commute by bike as much as possible. I drive halfway to the Metroparks, then ride a bicycle the rest of the way. Q: What do you like best about working at Century Cycles? A: I’m still doing something I believe in. I have the fulfillment of seeing projects come to fruition and seeing people become transformed by bicycling. I love to come to work every day!